Flattering50: Are You Ready for Some Downton Abbey? Editor's note: Fear not. This post contains no Downton Abbey spoilers. Yes, I'm one: a true-blue Downton Abbey fan counting down the hours to the first episode of Season 4. If you knew me, like my boys do, you wouldn't be surprised. For years, my children have referred to me as a "costume drama geek." And the costumes in Downton Abbey, especially Season 2, are fabulous! On New Years Day, my husband and I took a stroll around a nearby estate. There's nothing in my wardrobe that remotely resembles the fashions of the 20th century's early decades. Instead, I fudged a Downton look with a quasi-equestrian outfit (above). Tally-ho. 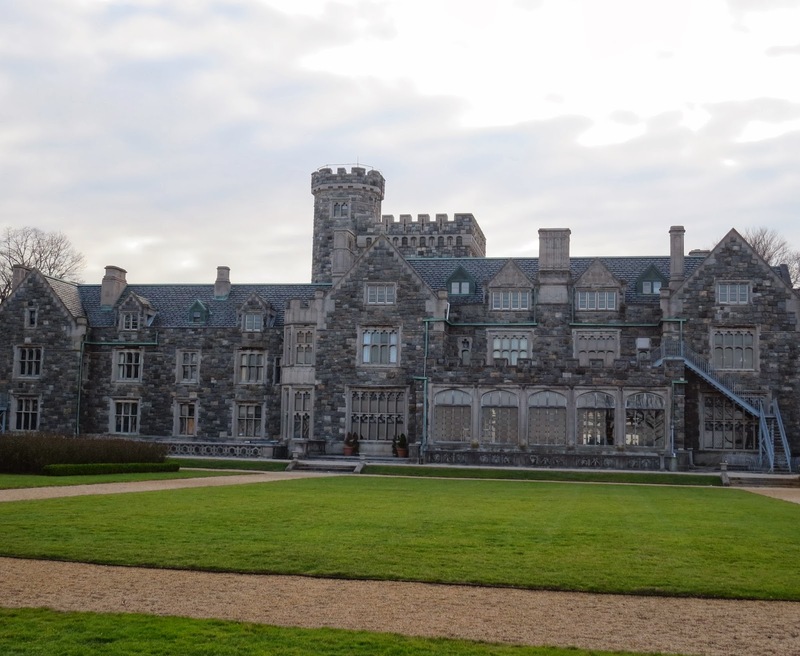 Long Island's North Shore, sometimes referred to as the Gold Coast, is where many of America's rich and famous--the Vanderbilts, Woolworth, Roosevelts, Whitneys, to name a few--built majestic country homes in the late 19th century. As times changed, many of the estates became "white elephants" and were torn down. Of the 100 or so still standing, a handful are open to the public. To get in the Downtown Abbey mood, my husband and I strolled the Guggenheim estate in wealthy Sands Point or "East Egg" to F. Scott Fitzgerald fans. At the top of this post, I'm standing at the front of the house, where there's a rather elegant porte-cochère. Here's another shot at the opposite side of the house. Meanwhile...leave it to New York to take advantage of the series' fandom. A couple of weeks ago, while Christmas shopping in Midtown, I stumbled upon a Downton Abbey tea van. Seriously? Do the producers think they need to promote the massively popular series? A bunch of people were mulling around, taking photos and having a cup. I snapped a couple of shots to share with you.